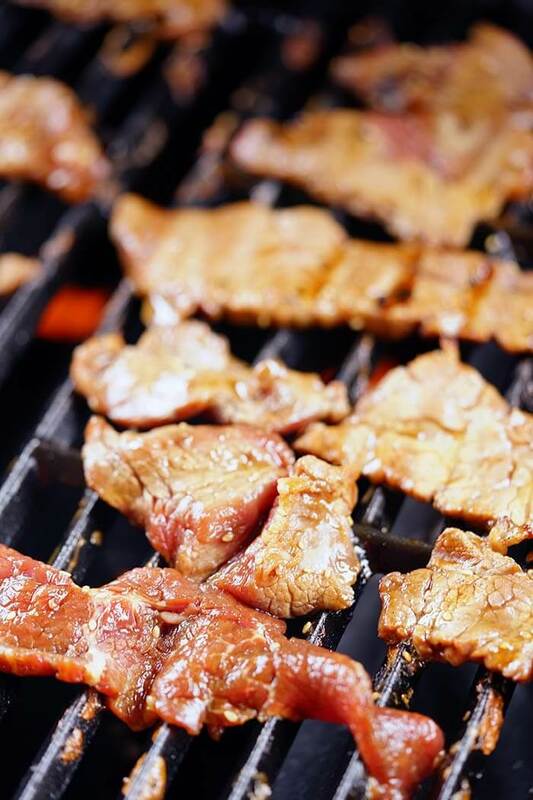 Korean BBQ Beef is marinated meat thinly sliced. It is quickly cooked over a super hot grill. The marinade is spicy and sweet and completely delicious! It’s easy to make (have your butcher slice the meat), super flavorful, tender and a great choice for a barbecue or cookout! Big flavor with just a quick marinade, this is a meal your whole family will love! It’s been HOT here in the valley and it will only continue to get hotter. 100 today – 106 by the weekend. UGH – BUT it is Fresno and we are used to triple digits in the summertime. Since tomorrow is the official first day of summer, Mother Nature is saying why not kick it off with a bang, right? I know Fresno would suddenly become a more popular place to visit, that’s for sure! First things first, does that picture above totally make you drool? I hope so! Truly this is one of my very favorite meals! I have a lot of favorites don’t I? Most of my favorites involve food with BIG flavor and this is one that definitely qualifies. 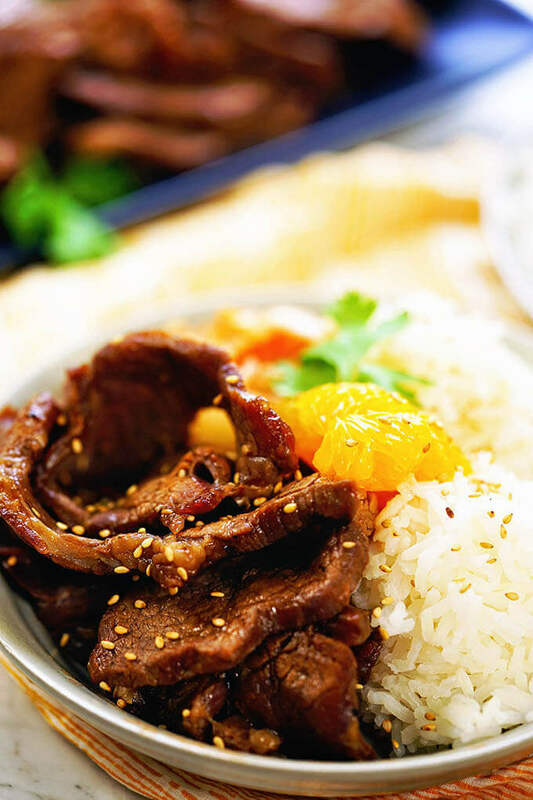 Korean BBQ Beef should be on your menu this week! This meal cooks up super quickly and has a ton of sweet/hot amazing flavor. What is Korean style BBQ? See? Easy stuff right and you might just have everything in your fridge and pantry, so why not give this a try soon? Korean BBQ on the grill cooks quickly as it’s thinly sliced. What kind of meat is used in Korean BBQ? There are two main types of beef in the Korean BBQ short rib meat & or thin slices of rib-eye. You can also use top or bottom round. This time I used tri-tip. Just make sure the meat is very thinly sliced against the grain, that way is will be tender! Ask your butcher to slice the meat for you, most are happy to help you out as it’s one of the services they offer. I love the flavor of tri-tip and it’s also a more affordable cut. After marinating the meat goes on a super-hot BBQ grill and is quickly cooked. Prepare the Korean BBQ Sauce marinade. Set aside. Add the thinly sliced beef to the marinade. Seal and marinade for at least an hour or even overnight. Preheat the grill, get it screaming hot! Lightly oil the grill. Working in batches, spread the meat on the grill and quickly sear it for about 1 minute each side. Remove immediately and repeat until all the meat is grilled. Served piled on a bowl of rice, add a serving of kimchi and mandarin oranges to each bowl. Garnish with minced cilantro, sesame seeds, jalapeños and green onions. Thinly sliced this BBQ cooks very quickly, about a minute per side. Be careful not to overcook! What are Korean side dishes? kimchi – and before you turn up your nose, give it a try! Do you like sauerkraut? If you do, I bet you’ll really enjoy kimchi! eggrolls – really the list goes on and on! Here’s the deal – eat what you enjoy, but don’t be afraid to step a bit outside your comfort zone, you just might find a new delicious flavor you love! I enjoy serving a spicy meal with bright flavors like mango, canned mandarins or even strawberries! All offer a bright taste that pairs nicely with the rich flavors of this meal. Grab the Korean BBQ Sauce Marinade recipe just click here. Looking for more tasty marinades? 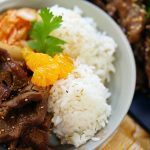 Easy and flavorful Korean BBQ Beef is an easy meal in a bowl! 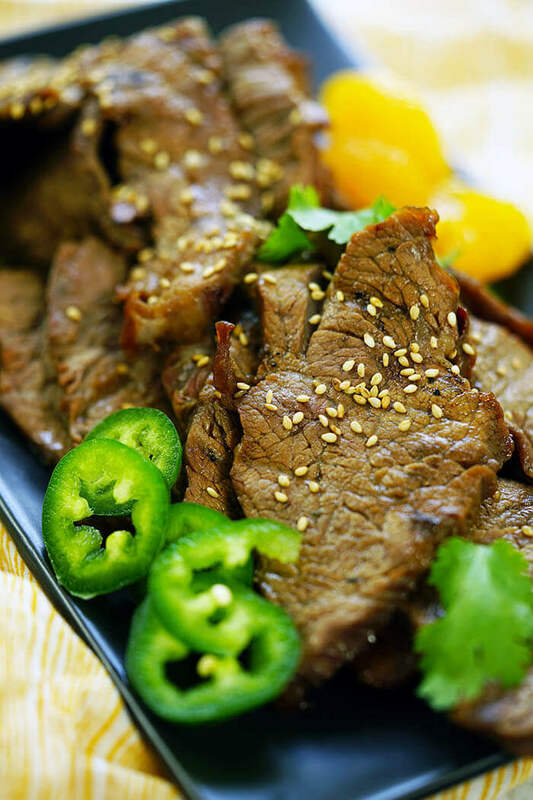 Be sure to head over to the website and grab the Korean BBQ Sauce Marinade recipe ==>> click here. If you make yummy dish, please be sure to leave a comment and/or give this recipe a rating! I love hearing from you guys and always do my best to respond to ever comment! Oh, and if you do make this great BBQ dish, don’t forget to tag me on Instagram so I can see! Marinated meat thinly sliced is quickly cooked over a super hot grill. The marinade is spicy and sweet and completely delicious! 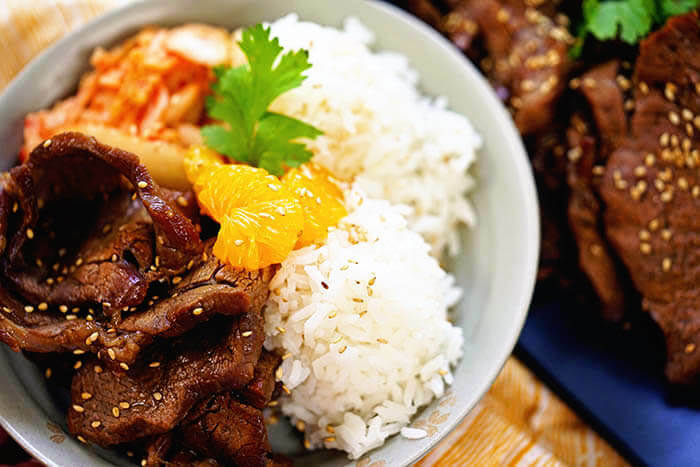 Korean BBQ Beef Bowl is flavorful, tender and a great choice for a barbecue or cookout! 4 cups rice white or brown, use your favorite! Add the thinly sliced beef to the marinade. Seal and marinade for at least one hour or overnight. Preheat the grill, get it screaming hot! Lightly oil the grill. Working in batches, spread the meat on the grill and quickly sear it for about 1 minute each side. Remove immediately and repeat until all the meat is grilled. Garnish with minced cilantro, sesame seeds and green onions. This recipe is so good! And it’s so easy to follow, yet the result sounds so delicious! This Korean beef looks amazing, Debra. It’s something that has been on my to-do list for some time now and once again I have to thank your for giving me the inspiration to just do it! Wonderful Dan!! I know you’ll just love it – this BBQ has so much flavor! This was delicious… the marinade charred in a few minutes for a fantastic texture on the meat! So much flavor and it was sooooooo easy! I’m so glad you enjoy it Michele and thank you for letting me know!! I know they will – thanks for stopping by Angela! I crave Korean bbq, it’s like comfort food to me! Thank you for this recipe, I can’t wait to make it myself at home! I’m going to have to double this Korean BBQ beef recipe so I can also pack it up for my lunch during the week. Love how quickly this dish comes together. It makes a great sandwich, you’ll have the best lunches this week!!! This looks delicious and so much better and healthier than take-out! Keeping this in my pocket for a busy week! Perfect Jennifer, it’s a great weeknight meal! This sounds so up my alley! I love korean beef! Korean BBQ has so much flavor, enjoy Madi!! Truly, this is MY kind of dinner! So much flavor, and nothing too complicated. Thank you for sharing! Love those meals too Lori, life is complicated enough right?! !